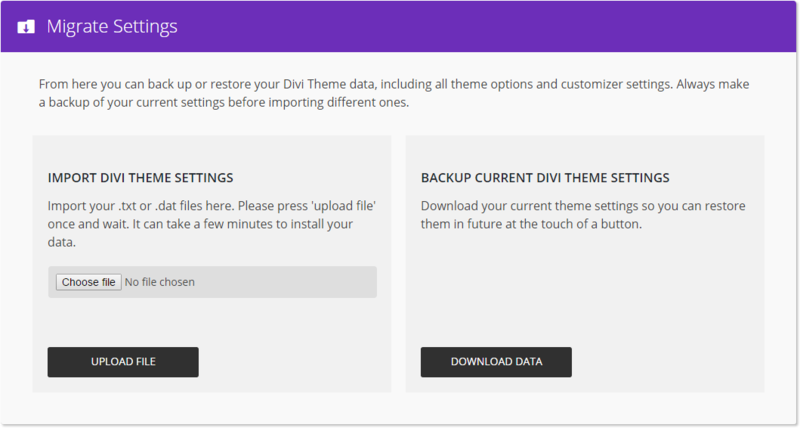 Back up and restore Divi Theme settings and customizer options with one click. Back up and restore Divi Theme settings and customizer options with one click. Move theme settings from one site to another easily. Create multiple theme options setups and bundle the data files into your child themes. Easy as pie. Download the plugin zip and install like any other plugin. In your dashboard, you’ll now have a ‘Migrate Settings’ option under the ‘Divi’ menu item. Please save a copy of your current theme setup first. This is the first part of a series of tools we’ll be building for developers of child themes. Our intent is to make it easier for great designers to package and sell their work. Please feel free to bundle this functionality into your own work or include it in your child theme. If you plan on adding it to your child theme, there’s a file to make it easy for you to add this tool to your functions.php already included in the zip. All of the theme data is included in the backups created. SO be sure to remove any sensitive information (such as API keys) if you plan on making your data files publicly available.